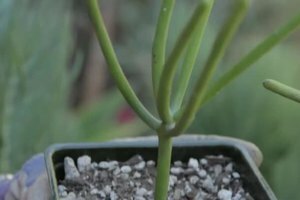 When repotting a snake plant, you always want to be careful of a few key things. 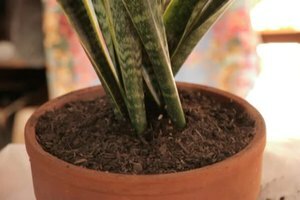 Find out about repotting a snake plant with help from an experienced professional gardener on a mission to make gardening stylish, fun and simple in this free video clip. Hi, this is Nell Foster, and today I'm gonna be repotting a snake plant. This is one that came out of, out of my garden. I had them in the front of my garden. I just want to show you how tough they are, and the roots travel by rhizomes. This is actually an offshoot of a mother plant, it's actually growing in an area that's really dry that's why it's looking that way, but I just want to tell you that this plant is really, really tough, unlike an African Violet or something that you have to be a little more careful about. I have potted some in my garden where I get them in a five gallon pot and the pot is totally cracked and the roots are coming out. The plant looks fine, it transplants just fine. So you don't have to be to, you don't have to candle them with kids gloves. So, you can, this one's probably gonna come out pretty easy because I just, I just got it from the grower like a month ago. So, you ease it out of the pot, there it goes. You might have to cut the pot off if it's really pot bound, so don't be afraid of that. And, you sort of loosen it up. You can see the roots right here. Oops, oh boy, that sure loosened up. So what I've done is I've put enough soil in the pot so that, oops, since some of it fell off, so I'm gonna put some more of the soil in here to raise it up, because I want it up about half an inch above the pot because it's gonna sink down. So, little bit more here soil here. There we go, there that's gonna get it. You can just hold it together if it starts to fall apart you can hold it together up here. And I love worm casting and compost, it's what I amend my plantings with, so I'm gonna go in and put a few handfuls of that around here before I go ahead an fill it in. And then I'm gonna go in and fill around so the plant will be supported in the pot. I'm just gonna go around and I'm gonna fill in with soil all, all the way around so it's nice and even up here. And it's very important you use a soil that drains really well. I have been working with plants for ages, so I know how to keep them wet and dry, so I'm just using a regular potting soil with this. If you tend to be heavy on the watering you might want to use half cactus mix half potting soil, because that's gonna keep it drier, but it's really important that this drains very well, because this plant can actually go about four weeks without water no problem at all and they like being on the dry side. Just so, make sure you don't use a heavy soil for it and keep it dry. So I'm gonna go, I'm gonna go around and I'm going to fill the pot back in with soil.